Two years later, another Finland-based company, Nils Master, unveiled numerous balance-lure designs, most notably, the Jigger and later, the Jigging Shad. Kuusamo Finland followed in 1967, offering several more fascinating designs, such as the Sukeltaja, a tiny 1-inch, 1/3-ounce “Kirppu,” a so-called variation on the balance-lure theme, lacking the second opposing hook on the nose of the lure. Across Finland, Sweden, Norway, and much of eastern Europe, the term “balanced” has been used to describe numerous horizontal-hanging lures for at least 50 years. Doug Stange first wrote about the Jigging Rap in In-Fisherman magazine around 1985. The beauty of a balance lure is threefold—random darting action, a perpetually balanced, horizontal baitfish posture, and the ability to hook fish no matter where they bite the lure. A line tie at the top-center of its horizontal body provides a fulcrum on which the lure’s action turns. Most designs are balanced in the sense that they swim, dart, and glide in a horizontal posture, always returning to a lifelike stance at rest. A single hook is on both the nose and tail of most of these lures, while a treble hook hangs from the center of the belly on many versions, which can be tipped with a small minnow, minnow head, larvae, or softbait. Creating its darting action on the upstroke and sideways or circular glide on the pause, the tail section of many balance lures has a plastic wing-like lip. North American anglers, particularly panfish specialists, have long enjoyed a limited offering of balance lures, as most of the principle Scandinavian tackle companies didn’t distribute product in North America. Today, there’s a broader selection, with choices from Rapala, Nils Master, Acme, Lucky John, and Fiskas. Akara Fishing is another company, operated by Vladislov Loginov and his sister Natasha, who moved from Riga, Latvia, to Carl Junction, Missouri, several years ago to join the North American scene. I’m a fan of their products, including their balance lures, several of which put big crappies and perch on the ice. Fiskas, a Swedish manufacturer of elite ice-fishing baits, has for the past 17 years circulated its lures among the American market from Saline, Michigan. Husband and wife Jamie and Carmin Olson operate the enterprise, as well as yourbobbersdown.com, an online store for hard-to-find ice-fishing tackle. Fiskas offers over a dozen lures in the balance-lure category. Each model has a different body shape and balance point, resulting in different swimming actions. Different lure shapes, angles, and profiles produce different actions. The Jigging Rap and Northland Puppet Minnow, for example, produce a similar dart-glide action. It’s an effective combination of moves, but not the only one at our fingertips. 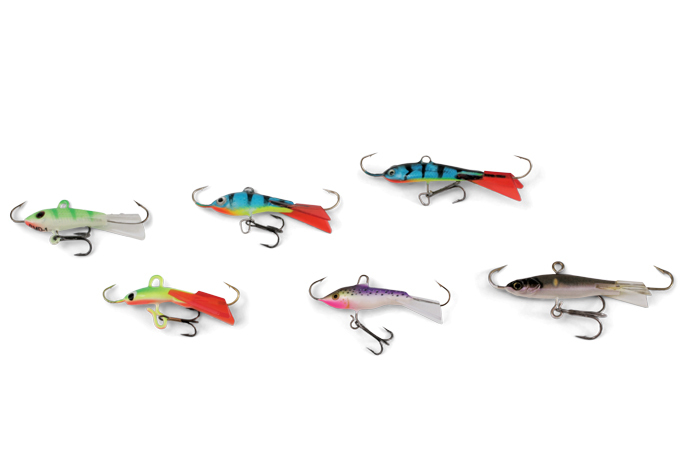 Experiment with a range of balance-lure profiles. Body shape and angle, eyelet placement, and the way you counterbalance it with plastics or livebaits can broaden your ice game. Compare a #2 Jigging Rap with an Akara Mosquit or Fiskas Red Tail Swimmer. While the Rap has a cylindrical minnow shape, the Mosquit and Swimmer feature a wide, flat underside and have similarly sized plastic wings, producing accentuated glide. The Mosquit is the lightest of the three, with a flat belly to plane in slower, wider arcs when you pause between jigging moves. The Red Tail Swimmer has the largest, widest tail that couples with its flattened belly to glide in the widest arcs of the three, though its heavier weight (relative to its length) makes it move with faster jukes than the Mosquit. Consider each lure in terms of fish activity. For deeper perch and crappies that launch up to crush whatever drops into their vicinity, I like the Rap, the heaviest of the three. But that’s not the only situation in which a balance lure’s action and profile attract fish. For fishing crappies or bluegills in 7- to 15-foot depths, the Mosquit can excel. And, because it lacks a belly hook, you can fish it effectively around vegetation or zebra mussels. 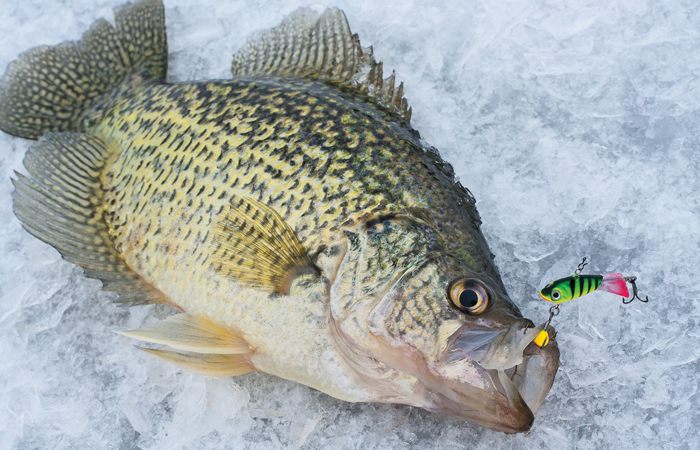 Moreover, a slow-glide gives neutral crappies ample time to inspect the offering and eat. Panfish often bite the treble hook on balance lures, so many anglers think this hook is necessary. But often, panfish bite it because it’s there, sometimes even if it isn’t tipped with livebait. The treble hook often isn’t necessary, and around vegetation, it becomes a disadvantage. Balance lures both attract and trigger. There no denying the one-two punch of a search lure, in this case a balance lure with the treble hook removed and replaced with a 1- to 4-inch section of light mono or gold chain tied to a small hook tipped with larvae. The lure plummets fast, attracts fish with its ample size, and compels less-aggressive fish to bite the bait dangling below. Perhaps the dropper and baited hook resemble bits of food discarded by the “mothership” above. I prefer a 2- or 3-pound-test mono dropper and single #12 to #16 fly hook, such as a Gamakatsu C12. Mono sinks slowly, causing the tiny hook and larvae to flutter, rather than being yanked down fast below a chain. Flutter looks more natural and makes it easier for fish to inhale the hook. 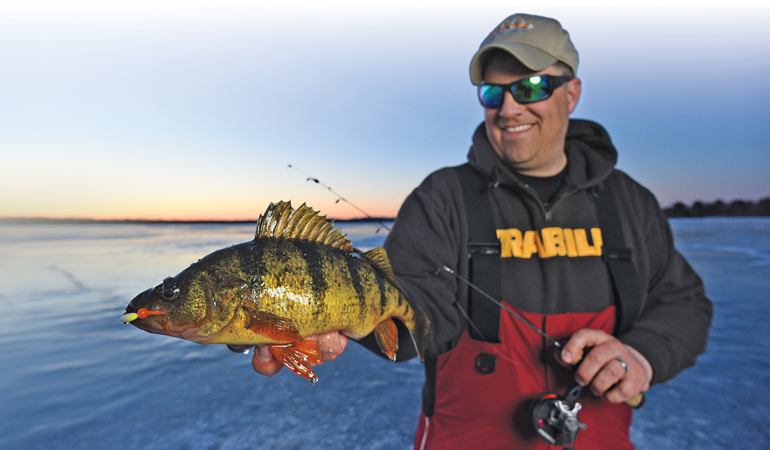 In deeper, 20- to 30-foot zones, a search lure is effective yet underutilized for panfish. In shallow water, tiny 3/4- to 11⁄2-inch balance lures, such as the Mosquit, glide wide and attract fish from a distance. They’re small enough to eliminate the need for a belly hook. Crappies, perch, and bull bluegills bite micro balances like the Mosquit head-first most often. Large crappies and perch often inhale the entire lure. Sunfish “kiss” them head-first, but also attack a belly treble if it’s tipped with bait. Small perch act much the same as sunfish. A challenge with sunfish is hooking light biters. Two winters ago, I discovered an exceptional bluegill jig that hooks light-biters well. Tough bluegill bites often occur when they mouth a jighead while eluding the hook. The Fiskas N24 Balance solves the problem. Cut from the classic balance lure silhouette, the N24 has a single #18 hook on each side of its body. It fishes like a jig, but because of the topside line-tie, its balance point keeps it horizontal. Sunfish, perch, and other short-strikers can’t bite it without getting hooked. At just 1/57-ounce, it’s the tiniest balance lure I’ve fished. But by dressing both hooks with larvae or soft-plastic tails, it fishes relatively large. Another trait that’s unique to certain balance lures is their ability to swim in wide concentric circles. 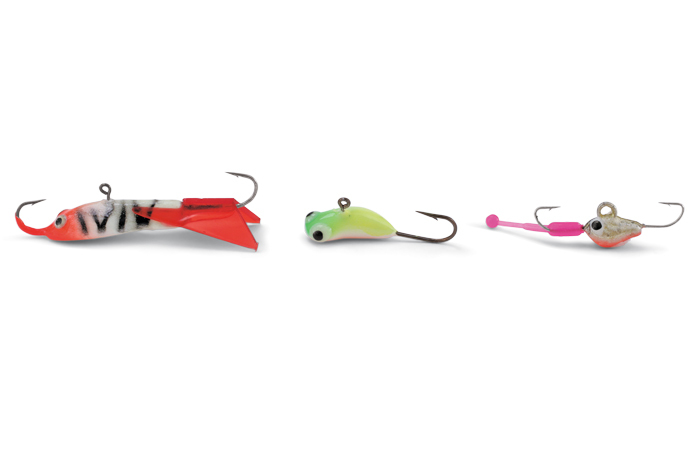 The Fiskas N25 Dog Leg looks rather like a mistake, but the little boomerang-shaped lure exhibits special abilities. Like the N24 Gill Getter, the Dog Leg resembles a jig with the line tie recessed back from the head to maintain a horizontal posture. It also lacks the usual plastic tail. The elongated body of the Dog Leg is curved, too, with the head portion turned away from tail at about a 140-degree angle. He says that amid a cadre of glow and fluorescent colors, plastics in muted colors such as brown can be effective, overlooked colors for ‘gills. One strategy is to couple a brown or black plastic tail rigged on a matching-colored lure with a spot of orange, pink, glow, or chartreuse. Red and black lures with solid black tails are amazing, at times. It’s been fun learning the subtle differences in shape, size, and configuration of various balance lures—differences that set them apart from the others in certain situations. I’m a fan of Akara’s Midge, a little slab-sided bait that mimics baby panfish. It also has a large set of 3-D eyes that I think help focus bites toward the head of the lure. It’s currently my favorite traditional panfish balance lure, with standard dual hooks, belly treble, and glide tail. It’s the same length as the #3 Jigging Rap, but puts out a bigger “footprint” with its flat, flashy profile. Big panfish often eat baby panfish, and the Midge features both the right size (1.5 inches) and flattened “slab” profile to match hatchling panfish. Acme’s 11⁄2-inch Hyper-Glide is one I want to try this winter. It’s weighted relatively lighter than most small balances, but I like the idea behind its retractable side wings, as well as its deeper-bodied profile that mimics a baby bluegill. A larger 2- to 3-inch balance lure can be a great attractor for big crappies and perch—and they’re fine deep-water tools and excellent when coupled with a dropper. But often, you need a second “throw-back” rod rigged with something small in order to close the deal when a fish appears on your sonar screen. A micro balance can be a best-of-both-worlds solution. If you fish some of the aforementioned 1- to 11⁄2-inch lures on the right line and rod, they “thunk” with the feel of a rock. For tiny balance “jigs” like the Fiskas Gill Getter, I use 2-pound Asso New Micron 3, a fluorocarbon-coated copolymer that’s tough, smooth (lacks memory), and stretches slightly. For traditional balance lures like the Akara Midge or #2 or #3 Jigging Rap, I like 3-pound Sufix NanoBraid joined by a small ant swivel to a 2-foot leader of 2-pound-test Asso Super Fluorocarbon. For these applications, I use the 24-inch St. Croix Custom Ice (CI24LXF) and a 32-inch Thorne Brothers Panfish Sweet Heart Stealth, respectively. The tips on both rods are fast, light, and responsive to impart micro moves to lures. The tips don’t fold under the load of a lure. They’re also sensitive, so much so that I don’t use a strike indicator, which is just as well, as I don’t like the spongy flex of most indicators that can make for sloppy balance-lure presentations. Balance lures fish like little puppets on a string. They do what you tell them to do. Big sweeps up followed by long, gliding swims on the way down will always be fish attractors. Patience is a virtue, too—lots of longer pauses to let the lure sit. You might be surprised by the number of jolts you detect as a fish wolf your lure at rest. In between, short and fast rod-tip pops produce moves all ice anglers ought to master. *In-Fisherman Field Editor Cory Schmidt, Brainerd, Minnesota, often writes on evolving lure presentations and strategies on ice and open water.